When you look at teams that overachieve and out perform, the common denominator is often coaching. Coaching makes a difference. We have seen great coaches, good coaches and indifferent coaches throughout our careers. The great ones share some things in common. 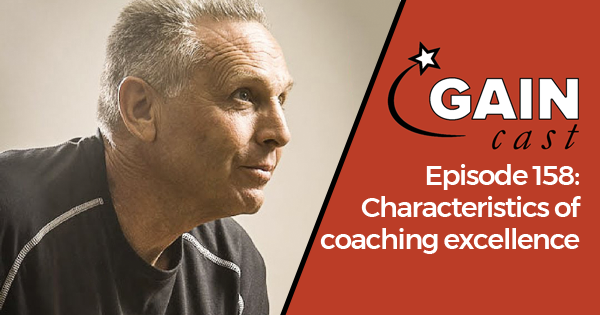 On this week’s GAINcast we discuss the common characteristics of coaching excellence. Vern recently wrote about 13 characteristics of coaching excellence. We go in depth on all of those points and more on this episode. 21:45 – Strengths and weaknesses. 22:30 – Persistence, drive, and determination. To hear more about these topics you can listen to the full episode above. If you like what you hear on the GAINcast, don’t forget to give us a review and subscribe on iTunes. The GAINcast is brought to you by GAIN and HMMR Media. Applications for GAIN are now open and you can learn more here or at www.thegainnetwork.com. Also join HMMR Plus so that you don’t miss out and get full access to our video, article, and podcast archive here on HMMR Media. You can read more about each of these points in Vern’s recent post.